That could change this week as President Donald Trump’s top trade negotiator and other senior U.S. officials head to the West African nation of Togo to review a Clinton-era free trade pact with sub-Saharan Africa, in the administration’s first high-level delegation to visit the region. Looming over the two-day ministerial is China’s growing role in African trade and influence, as Beijing finances massive infrastructure projects in the region, some through its new Asian Infrastructure and Investment Bank. While U.S. exports to sub-Saharan Africa as a whole have doubled to $21.81 billion from $10.96 billion in 2000, according to U.S. Commerce Department data, they were dwarfed by China’s $102 billion in exports to the region in 2015. Also at issue is whether the Trump officials, led by U.S. Trade Representative Robert Lighthizer, will signal a desire to change the trade agreement before it expires in 2025. Trump has sought to bolster his "America First" campaign by withdrawing from the Trans Pacific Partnership, threatening to rip up NAFTA and seeking to renegotiate the U.S.-South Korea free trade deal. Launched in 2000, the African Growth and Opportunity Act (AGOA) has been barely mentioned by any Trump officials. But no moves toward an early renewal or extension of AGOA are expected, said Constance Hamilton, deputy assistant U.S. Trade Representative for Africa. Lighthizer will stress the importance to the administration of deepening its trade relationship with Africa, but will also caution that African countries should "engage in fair trade, eliminate barriers to U.S. exports and abide by the eligibility criteria of the AGOA program," said Hamilton. 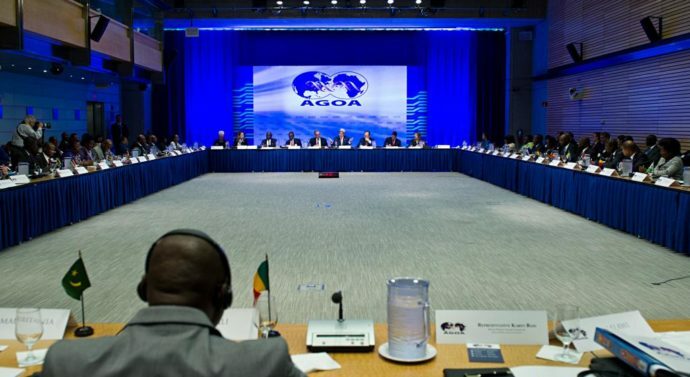 The U.S. trade deficit with the 38 AGOA countries shrank to about $7.9 billion last year from a peak of $64 billion in 2008, as U.S. shale oil production increases have lessened the need for oil imports from major exporters Nigeria and Angola. Overshadowing the talks will be an "out-of-cycle" review of AGOA trade benefits to Rwanda, Uganda and Tanzania, which have supported a phased ban on imports of second-hand clothing. U.S. groups say the move violates AGOA rules. "The fact that we accepted the petition under the Trump administration, I won’t say that means we’re any harder on any countries, it just says we respect the criteria," said Hamilton, who emphasized that the issue was still under review by USTR. "This administration has just shown almost zero interest in Africa," said Elliot. "It has not been a big focus, there is no sign at all that it has engaged the president’s interest." Scott Eisner, president of the U.S. Chamber of Commerce’s U.S.-Africa Business Center, said African countries should look at reforms to attract more foreign investment. AGOA, in its current form, will likely become irrelevant for a number of markets by 2025, he said. "Those governments that want to continue to count on the U.S. market need to be prepared to come to the table to have bi-lateral or regional trade talks - whether they are called a free trade agreement or something different," Eisner said. Peter Barlerin, a senior State Department official, said African nations need to start thinking about what comes after AGOA. "We’re not going to see AGOA stretching out to infinity, so eventually we will move into some other kind of arrangement, and that could include bilateral or larger free trade agreements with parts of Africa," he said. There are contradictions, on the one hand, between the fact to acknowledge that China’s exports to Sub-Saharan Africa (SSA) have been 5 times larger than those of the US in 2015 and the fact that AGOA text criticizes "the unfair practices by the European Union that condition African access to the European market on signing imbalanced and substandard trade agreements" and, on the other hand, to pressure SSA countries to "eliminate barriers to US exports".